Two Sundays ago I went to the BEST art marketing seminar I’ve ever attended—The Art of Selling Art (theArtEngine.com). The presenters, Margaret Danielak and Julie Snyder, really hit the nail on the head. Check out their website if you’re an artist and serious about selling your art. One point they stress is that artists MUST have inventory. Besides high-quality work, galleries want to know that we can produce. We have to be ready to pull together a significant number of our best work at a moment’s notice. I have two shows coming up next month; one I just signed the contract for last week. Time to get busy! I like deadlines…they get my blood pumping and my creative juices flowing. At the end of 3 weeks, I will have a collection of 30 small paintings demonstrating the newest direction of my work. Can pull 3 recent works from inventory. Had already started 7. Last week I put a first layer on 17. Today I’ll begin 3. Total: 30. My goal: take a brush to 5 paintings each day. 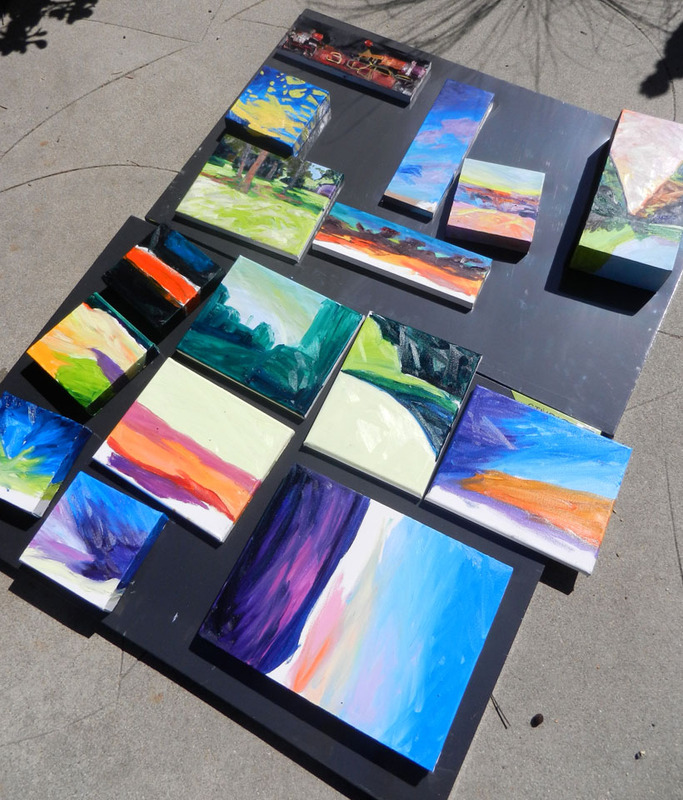 16 paintings are currently drying in the sun (above photo). Will report in same time next week. Gotta go paint…. Solo show at Portfolio Coffee House in Long Beach (November 15 through January 15, 2014); Arroyo Arts Collective Discovery Tour—a one day self-guided auto tour of galleries, artist’s studios and historic buildings in the greater Mount Washington area (Sunday, November 24, 9:30 am–5 pm). You are truly an inspiration Bonnie! I can’t wait to see the new littles. You are an inspiration to us all Bonnie. Can’t wait to see the new littles. Hi Bonnie! Terrific post and very motivating indeed! I am also on the Discovery Tour – sharing home of another artist who lives in the area – where is yours? Hi Louise! How great that you’re on the Discovery Tour! This is my third year—I LOVE it. I’m showing with two friends in a gorgeous craftsman home at the top of a hill surrounded by other artists’ homes. 5328 Abbott Place, 90042. Whoo hoo, Bonnie! You rock!